My Fun Fish Tank Reviews - Is it a Scam or Legit? 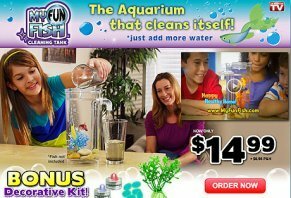 The My Fun Fish Tank is a self-cleaning fish tank that promises to be a perfect, addition to any room; simply add fresh water whenever the tank needs cleaning, and the dirty water is forced out through the attached spout. At its most basic, My Fun Fish Tank is a clear, round plastic tank that looks about the size of a water pitcher (listed size is 4.5” x 4.5” x 10”), which holds about half a gallon of water. Attached to the tank is a small tube with spout that runs from the bottom and pokes out near the top. To use My Fun Fish, first fill with water and fish (neither of which are included), cover the bottom with the included river stones, and adorn with the (optional) decorative kit. Once complete, the manufacturer claims you’ll have created “an incredible water world” that will “captivate your family’s imagination”. When the tank gets dirty, instead of dumping and cleaning, My Fun Fish is claimed to use “gravity clean technology” to keep it free from cloudy debris. And when you pour in the new water, this “technology” will force the old water through the tube and out the spout, which is claimed to keep water fresh and oxygenated, and (presumably) your fish happy. What is My Fun Fish’s Gravity Technology? While it certainly looks cool when it’s occurring, the My Fun Fish tank is simply using fluid displacement to flush dirt and debris that’s settled on the bottom through the attached tube, but only once new water is added. In other words, there can only be so much water in the tank at any given time, and once this level is exceeded, the excess water is automatically pushed out. Will My Fun Fish Work as Claimed? However, this also means that any debris inside the tank needs to be heavier than the water surrounding it. Otherwise, it won’t sink to the bottom or be flushed out. As such, you’ll still almost certainly be required to clean your my Fun Fish tank in order to remove floating debris (something a traditional pump and filter would achieve) and to clean the buildup of algae. What Are Consumers Saying about My Fun Fish? Since writing our original My Fun Fish review, 22 HighYa readers have provided feedback on their experiences and rated the tank an average of 2.5 stars. While some customers claimed to have had positive experiences, the most common complaints seem to revolve around failure to work as advertised (doesn’t clean debris adequately, etc. ), and poor quality (cracked plastic, fish die soon after placing in the tank, plants can cut fish’s fins, etc.). On Amazon, My Fun Fish garnered an average 3.5-star rating from more than 210 customers, where the compliments and complaints were similar to those on HighYa. From a company perspective, My Fun Fish is brought to you by Product Trends, a division of Hampton Direct, Inc., a direct marketing company based in Williston, Vermont. Product Trends held a B+ rating with the Better Business Bureau despite 120 closed complaints (as of 7/6/15), most of which appeared to revolve around higher order totals than expected, frequent sales calls/spam email, and difficult customer service experiences. Granted, this doesn’t mean you’ll experience the same with My Fun Fish, although it might be something worth keeping in mind. My Fun Fish sells for $14.99 plus $6.95 shipping, bringing your total to $21.94. You’ll also have the option to order the decorative kit at checkout for another $6.95, plus an additional $1 web processing fee, making the total $29.89. You’ll have 30 days to try My Fun Fish and if it doesn’t turn your room “into an under-water world of discovery” (or for any other reason), you can return it for the initial $14.99, although the company will keep any handling fees and you’ll have to pay to ship it back. Bottom Line: Is My Fun Fish Tank Right for Children? Overall, My Fun Fish seems to be a good idea for parents who want to give their kids a nice fish tank for their room, although there are a few “red flags” we’d like to re-emphasize. Perhaps the most important of these is the size of the My Fun Fish tank. At 4.5” x 4.5” x 10”, it’s not very roomy and seems only large enough to hold one tiny fish and a plant. Second, whenever shipping/handling fees are close to (or more than) the price of the product, you should realize the manufacturer is still making money off of you, even if you return it. Finally, the Product Trends’s negative BBB rating lets you know that people have had been very unsatisfied with their products, customer service, or getting their money refunded. As such, if you want a fish tank for your family, we’d suggest visiting your local pet store. Great tank. You can get it at the dollar store for $4, the same quality. Great for goldfish - my goldfish are so super happy in it. The LED light lasts very long, but all you need is a small battery. It's a very cool idea. I bought it for myself so my grandkids would have something to see when they come over. It's a great idea and it works just like they said. It's great. I certainly can't speak for everyone but I'm happy with this fish tank. I bought this for my 4 year old daughter for Christmas. We have a goldfish and we've had an easy time with the tank so far. However we don't follow the directions...let me explain. - We change the water every 2-3 days. We use filtered water and do a complete change (and beyond). We run about 3 pitchers full of water through the tank each time we change the water to ensure that we get as much waste out as possible. - We feed our fish daily with a variety of foods and only leave as much as she can eat in 5-6 minutes while scooping out the rest. One time we'll give her flakes, another time we'll give her dried meal worms and sometimes floating pellets. - When we clean the tank we also use a net to catch as much floating waste as possible. We feel this helps keep the tank cleaner. - The only thing that I don't like is that the LED light doesn't last...at all. It goes out after 2 or 3 days so we rarely use it. If we find a suitable replacement light, I'll post a follow up. As I said, we have a goldfish so maybe it's different but it works for us and I would recommend the product but before you buy it make sure you read about how to feed and care for the fish that you want. We didn't have a clue that goldfish required different types of foods and that there are some fish foods that carry no nutritional value. Lastly, keep in mind that cleaning the tank once a week just won't do, plan on cleaning it ever 2-3 days. Everyone needs to realize unconditioned tap water WILL KILL THE FISH. The water either has to be conditioned with a product from a pet store, which works immediately, or rinse out a gallon milk jug with water only 2 or 3 times. Then fill it with your tap water. Leave this out for 24 hours, uncovered to remove the tap water chemicals. Then and only then can it be used or the tank. As far as cleaning the water, pour the clean, conditioned water slowly into the tank FROM THE SIDE, this will force the dirty water out as it is supposed to. If it is done from the middle of the tank, all this does is stir the water, not force it through the cleaning tube. You are right about setting the water out for 24 hours to remove chlorine. However, my city has switched to chloramine from chlorine. Chloramine does not ever evaporate from the water (I am not happy about that). So, check what your local city uses in their water. Enjoy. I bought two of these fish tank for my 5 years old son's two beta fish. I followed the direction exactly as directions said. Both beta fish died within a month. The LED lights worked for about two hours and died. The self cleaning is a joke. You have to wash it like any other small tank. I bought two more beta fish, changed the plastic plant provide to a softened plastic plant, and I changed the small rocks to bigger glass rocks. My son's two new beta fish are doing fine now. Not worth the money at all. As with any fish tank, you can not just add tap water. The chlorine, nitrates, etc. in the tap water will kill the fish. You need to fill a gallon milk jug with water, no lid, and set it out for 24 hours to detoxify it, or get water conditioner for fish water from the pet tore. This will allow the fish to live. The manufacturer does not tell you these steps, they just want to sell the product. I believe if you try this, you will be happy with the product just as I am. The tank is small and the fish didn't even have room to turn around. I think pouring water in would cause brain damage for the fish. Did not work well. Sorry. I am sorry to see all the negative ratings. They are great tanks. First, I must say that the negative reviews I read seemed to have some negative experiences that aren't the norm. I have two of these tanks and just purchased two more. They are perfect for betta fish because they don't need too much food and you don't overfeed them and have extra waste otherwise you'll kill them. They also only require 1/2 c. of water to live or even less. The tank instructions say to flush the tanks once a week at most, not every couple of days as I read in a review. Because they are so easy to clean, you don't have to worry so much about algae getting out of control and they are very manageable. It's convenient especially for me who can't lift a lot of weight. My betta fish are very happy, my son is happy and were adding two more to the family. I would recommend these to any parent for young children and enjoy the smiles on their faces. You can put two tanks next to each other and watch the betta go after each other. It's hilarious. I had bought two of these and placed one male Betta in each. I followed the directions perfectly, conditioned the water, bought live fish tank plants, and did an 80% water change every other day. This, apparently, was not enough. Both fish eventually died. The first one, then about a month later, the other. They had developed a whitish mucus on their fins and died shortly after, regardless of any intervention I tried. Do not buy this tank. I don't know anyone who had a fish live longer than three months in one of these tanks. I am 27 years old, and this is this is the first fish I have ever had. We bought a male Betta Fish for my son because his Aunt and Uncle purchased this tank for Christmas. I thought why not give it a shot? This fish went straight from the pet store and into this tank. He seems to like his environment. We do have two plants in there, though I do agree the tank is not very big. Only one fish will fit in this tank. I love the self cleaning technique. I do make sure not to pour the water in too quickly because the pressure of the water does cause him to sink towards to bottom. I would highly recommend this product to any first time fish owners. I had a betta who was about 18 months old. He lived in a glass bowl for most of his life, but we decided to try out the My Fun Fish. I'm not blaming the tank because I do not know for sure what happened, but he died within two days. Please be careful if you purchase one of these tanks, I hope this keeps someone else from making the same mistake I did. This tank is a murderer. This tank is the worst thing I have ever bought in my life. My fish died after four days. Four days. It suffocated my fish and when I got home saw it was dead on the bottom. Please don't support this brand. I want it literally stopped and taken off the market. Parents getting their kids, this is the worst thing since their fish will not last and will scar the kid. I feel like I murderer my fish by putting it in jail. It's my fault for supporting this stupid company. Seriously please don't buy this. You only losing your fish by getting this and putting it through suffering. This doesn't even deserve one star. I lost 4 neon tetras (which I was assured would be fine in here). Then we bought our son a snail hoping (and being told that it was heartier and would do well). Write a Review for My Fun Fish!